"I'm very happy with this week," said Spain's Muguruza, 25. "It's a great feeling to come back and defend a title - it's never easy." 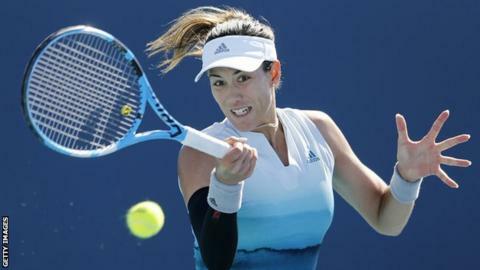 It is two-time Grand Slam champion Muguruza's first title since winning in Mexico last year. She returned to the sport competitively the following summer but has been involved in a custody battle with her son's father which has impacted on her tennis. "It's unfortunate I couldn't give my best today, but I tried my hardest," a tearful Azarenka said. Earlier, Madison Keys beat Caroline Wozniacki in straight sets to win the Charleston Open - her first title on clay. The eighth seed beat three Grand Slam champions - Wozniacki, Sloane Stephens and Jelena Ostapenko - en route to victory, as well as reigning Olympic champion Monica Puig.